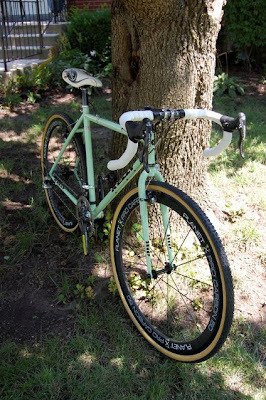 So here is my custom built Ti Single speed cyclocross bike. 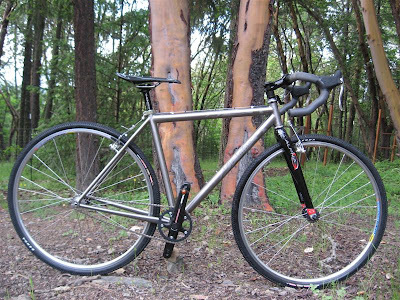 It started out as a raffle prize that Mike DeSalvo donated to the Southern Oregon Outlaw Cyclocross series in 2007. 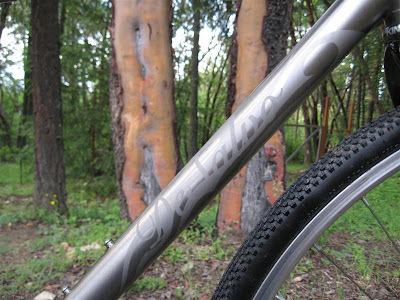 Upgraded the frame set to Ti (check out the sweet etching. not a single drop of paint or sticker on this machine!) and built it up as follows. My new Kelly, comes in just under 18lbs. Wheels: Planet X Pro Carbon 50 Tubular, with American Classic Hubs, bladed spokes. 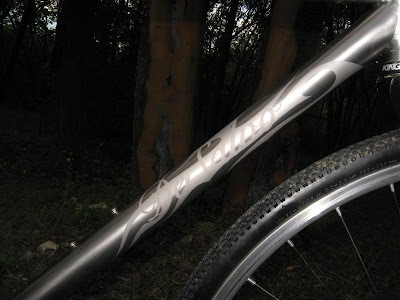 Reader's Question: Cross Pedal interference? Patrick---thanks for the comment, and your question brought about the update, fancy that! Anyway, I have always had issues with this myself as I have primarily used the Candy's as well. My solution is to grind/shave some of the tread where the Candy platform touches the shoe. Clip your shoe into your pedal at your house and see where the shoe is making contact with the pedal platform. Make a mental note, pull out the Dremel and grind away a little tread. This is what many people do. 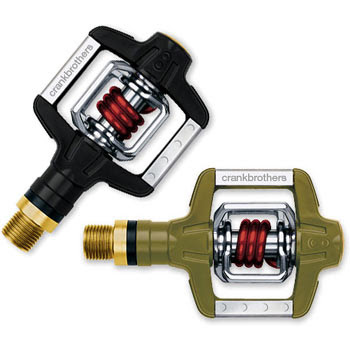 Additionally, Crank Brothers supply cleat shims for this purpose as well. I sometimes have had to employ both methods as the shims dont do enough shimming for some shoes. Thanks for the question, anybody else have any insights, put it in the comments! UPDATE: Patrick let me know that the shims supplied by Crank Bros worked great!